“I own a national service called LifeOnRecord which lets people capture and preserve their stories and memories from any phone. 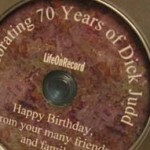 The most popular product is a keepsake CD that people will give for birthdays, anniversaries and other events. “Here’s how it works. Someone planning the celebration will sign up for a LifeOnRecord account. Friends and family all call a toll-free number and leave stories, memories and well-wishes. The recordings are all preserved onto a keepsake CD, and can also be managed and played via our website, or downloaded into iTunes. If your product would make a perfect gift, subscribe to The Gift List, a service that provides contact information for national and regional magazines, the top 250 daily newspapers, news wires and syndicates, national television, and national radio, as well as a list for web and blog outlets. These media are HUNGRY for press releases and photos about consumer products that make great gifts for Christmas, Mother’s Day, Father’s Day, Valentine’s Day and Graduation Day. I’m a genealogist. Family historians are a natural target market. You might also branch out into family and military reunions, where members of a certain military unit can record their recollections from wherever they are. How about high school reunions? Print media include Reunions magazine, Ancestry, Family Tree Magazine, etc. Since one use for your product is a wedding gift, do you do cross promotions with other professionals? Certainly wedding planners should top your list, but also DJs, photographers, florists. See if you can get on the recommended vendor or networking lists where these people are. If you aren’t doing it already, pitch wedding bloggers, websites and magazines. You could also promote general event planners as well. The great thing is you aren’t limited by location so the sky is virtually the limit for you as to who you can contact in just these two groups alone. I think you have a unique and useful product. Best of luck to you! Hi, thanks for all the responses! Cheryl, I do some cross-promotions with event planners, and I am a corporate member of the Association of Bridal Consultants. I’ve advertised on some wedding blogs, and gotten some publicity that way, but I’m always looking for new ideas. It seems like Bar Mitzvah’s tie in well with my service (the moms tend to value the preserving of memories) and the aunts, uncles, and grandparents of the Jewish child tend to be very talkative and emotional, but I’m trying to get my hands on a good list of Bar Mitzvah planners. Let me know if you know of any! 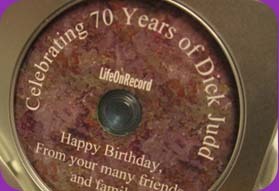 A keepsake CD is an excellent idea especially for older people such as my mother when they are no longer able to read as well as they used to and the family is far-flung around the world.